Last Saturday was a very pleasant summer day so we decided to drive up to northern Indiana and spend the day in Shipshewana. I actually had an ulterior motive. Ever since we were up there last month, talking with the shoemaker at the Center for Traditional Arts, 160 Morton Street, about my great-great-grandfather’s boots, I couldn’t wait to go back and show him the boots in person and see what he had to say about them. These boots belonged to my great-great-grandfather Louis Breuninger who was born in Bachlingen, Württemberg, in 1819 and came to America with his brother Carl about 1840. 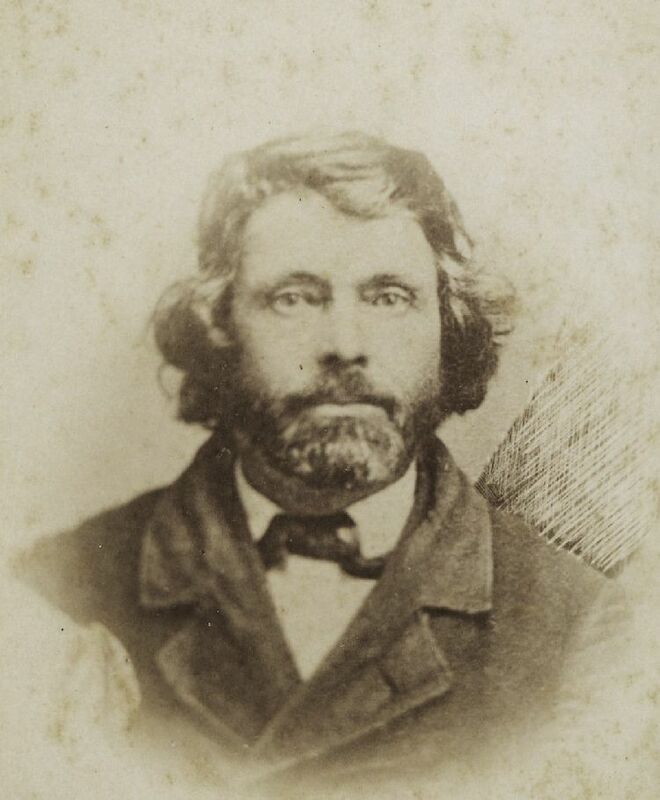 Louis lived in Green Bay, Wisconsin, until about 1869, when he moved to Van Wert County, Ohio, near Willshire. He died near Willshire in 1890. My mom found these boots in an old wooden chest/box in the barn along with some other items she said belonged to Louis. She thought that he brought the boots with him from Germany. When she found them they were very dirty and inhabited by wasps and it took her a lot of time and work to clean them up. Her cleaning paid off and they look like a new pair of boots! They are in very good, nearly pristine condition and I was eager to learn more about them from someone who is an expert on antique footwear. 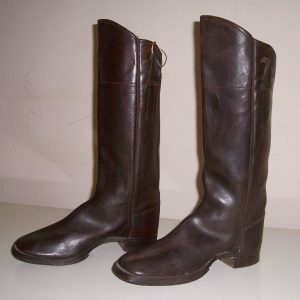 They are leather riding boots, but they could have been worn as dress or a work boots. They were made and machine stitched by a professional and would have been made specifically for Louis. They are a left and right boot, not a straight last boot made for either foot, as I first thought. This type of boot is called a Whole Cut Wellington, made from one continuous piece of leather, stitched for inner support. 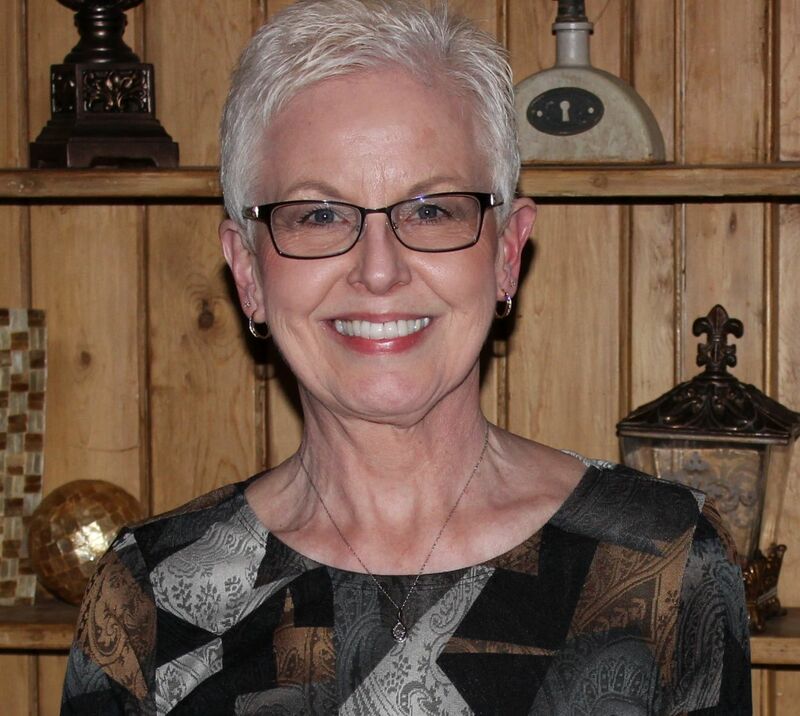 This style, high in the front and low in the back, dates back to the 1700s and they were popular during the Civil War. They have a steel shank and a clump sole. 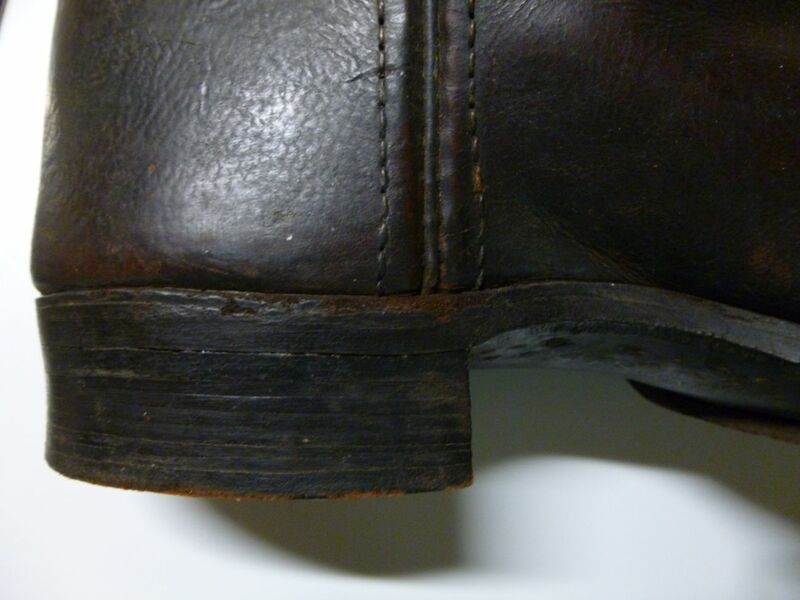 The heels consist of 8 layers of thin leather pieces stacked together and the soles are held together by screws, square zinc nails, and square wooden pegs. Heel made of stacked leather. 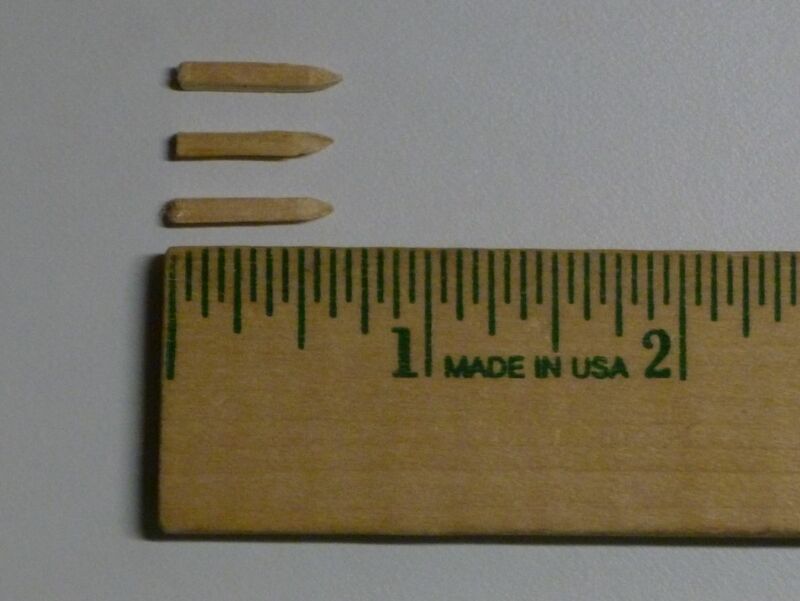 He gave me a couple wooden shoe pegs, which are about 5/8 inch long. 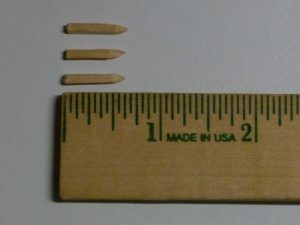 They put these little square pegs in round holes. Evidently this is where the term “a square peg in a round hole” comes from! 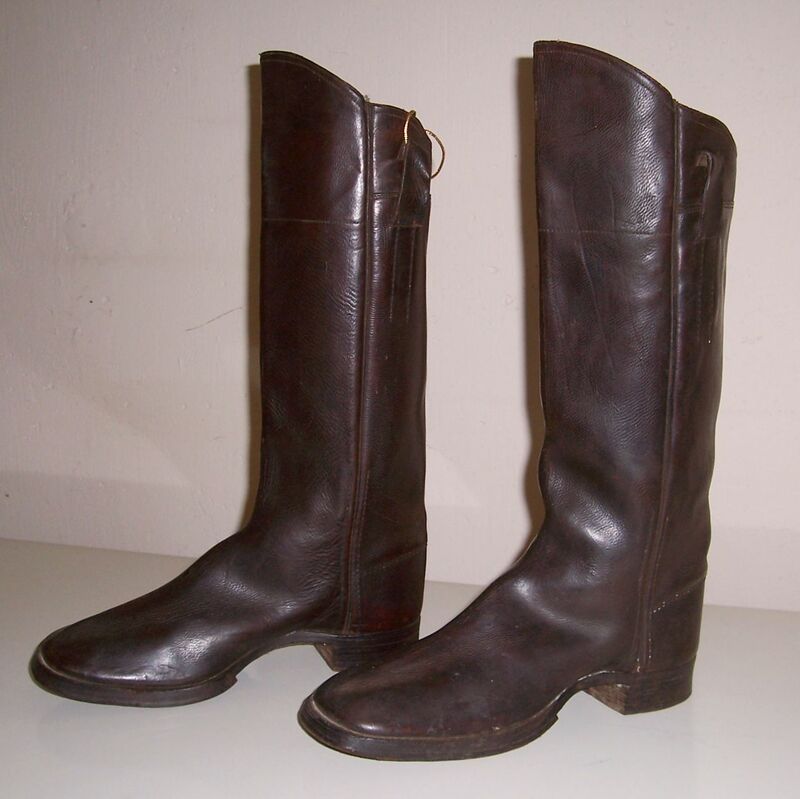 The boots measure 18 inches tall in the front and 15¼ inches in tall in the back. They are about 11¾ inches long and 4¼ inches wide at the widest part. They have a square toe and the heel is about 7/8 inch high. They are very dark brown or black and red on the inside top 4 inches. And they are heavy! They weigh a little over 7 pounds. 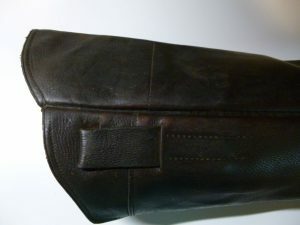 The leather is rather stiff, not soft and supple, and I think they would be difficult to put on. These boots look large but compared to Joe’s shoes, which are size 9½, Louis’ boots are about an inch shorter. So he had rather small feet. 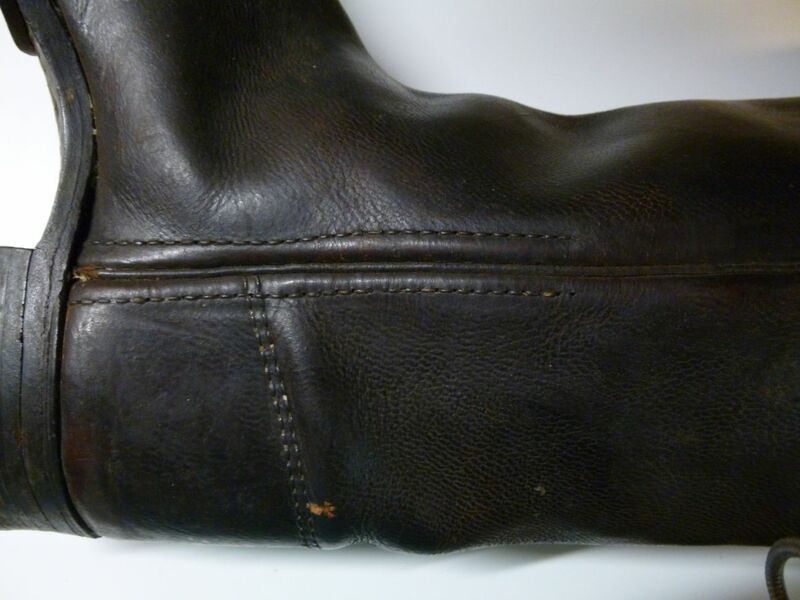 Louis’ boots were likely made sometime between the mid-1800s and the 1920s, but the beading indicates that they were made close to the 1900s. That news was a little disappointing because that means that Louis would not have brought them with him from Germany when he immigrated. If they are indeed Louis’ boots they would have been made before 1890, when he died. I am not sure how my mom determined they were Louis’ boots when she found them in the barn. Maybe grandpa Schumm told her that or maybe she found them with some of Louis’ other possessions. But since it appears these boots were made much later than we thought I suppose there is the possibility that they belonged to someone else in the family. Perhaps they belonged to my great-grandfather Louis Schumm. Louis Schumm (1851-1938) was Louis Breuninger’s son-in-law, married to Sarah Breuninger (1861-1921). My grandfather Cornelius was born in 1896, and they could have even been his boots if they were made in the 1920s. 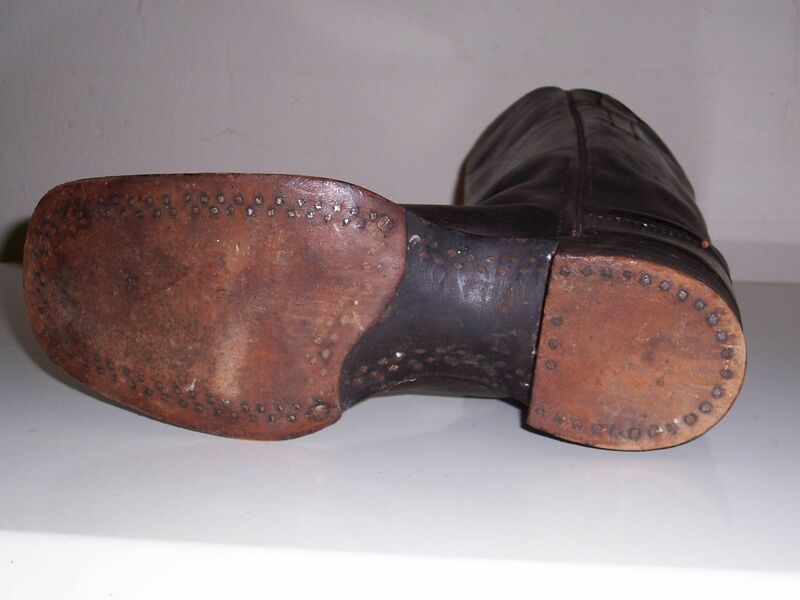 It is wonderful to know a little about the history and construction of this wonderful pair of old boots, which appear to have hardly ever been worn. For now I will go with what my mom said and assume they were Louis Breuninger’s boots. They are still a great family heirloom even though Louis probably did not bring them with him from Germany. Too cool! Thanks for sharing this post! What a find!